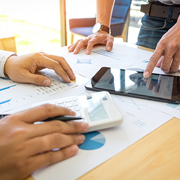 Understanding that forecasting business trends and outcomes is an important part of any financial strategy, enterprises are now looking at dynamic financial models to help them make better decisions. We at Outsource2india provide a comprehensive range of financial modeling services that help businesses analyze data more efficiently. When clients outsource financial modeling services to O2I, we collaborate with clients to proactively bridge gaps in data and to assemble the right information to finalize the model. With our two decades of experience in the financial research industry, we offer database management services like data validation, aggregation, adjustment, and enrichment as well as mathematical financial modeling services like factor selection, model building & validation, portfolio simulation and testing, performance analysis & stress testing, risk modeling, scenario, and portfolio analytics to provide you with a 360-degree coverage for all financial modeling requirements. At Outsoruce2india we take the load off our customers with specialized financial modeling services, allowing them to focus on core activities like deal structuring and client initiatives. Our strategic global presence and ISO quality standards ensure best services with an economic pricing model. A sector-specific model can be further enriched with inputs from one of our sector specialists. Our large team of Financial Analysts works to the advantage of our clients - for QC, back up and collaborative work. Excel being the major tool used, our financial modelers are experts at leveraging Excel programs and Macros. As a leader in providing financial modeling services in India, O2I combines experience with expertise not just to provide better financial modeling services but also to ensure clients benefit from them in the long term with our ongoing support services. We create customized and specialized financial modeling services that can be easily tweaked to fit a wide range of requirements. We understand that there could be busy seasons when your business is growing - Sell Side or Buy Side and we are a perfect partner during such spikes. Why Invest in Outsource2india for Financial Modeling? Outsource2india's experienced analysts have developed robust financial models to help investors, businesses, and investment consultants & bankers identify the current financial state of business and make predictions for the future. Here are some of the ways we can make a difference to your business. Our experienced financial analysts are adept at understanding your requirements just from specific objectives & instructions and ensure quickest turnaround time while providing you world-class financial modeling services. Instant access to industry-best expertise and financial modeling software to successfully achieve your company's revenue goals. Get a virtual financial support assistant to provide real-time support throughout the project. Skilled professionals to work with you no matter what industry or country that you hail from. Outsource2india was contacted by a UAE-based client who wanted our assistance in analyzing financial data of 10 quarters from 20 firms. We had to create a financial model and report based on the key metrics provided by the client. O2I was approached by a US-based fund governance organization for financial modeling services. Our team provided historical financial models for investor relations (IR) within a week's time. Outsource2india provides specialized financial modeling services, by drawing upon our other service lines like Business Research, Pharma Research, etc., to offer comprehensive research support to the clients. We offer firm and unwavering commitment to our global clientele. When you partner with us, you get a reliable and long-term partner to safeguard your finances. Call us today to get your Financial Models at competitive rates and in the shortest possible time.